Match it Fast – Power Up Your Day With Playful Puppies! Pawsitively the most adorable matching game on the planet! 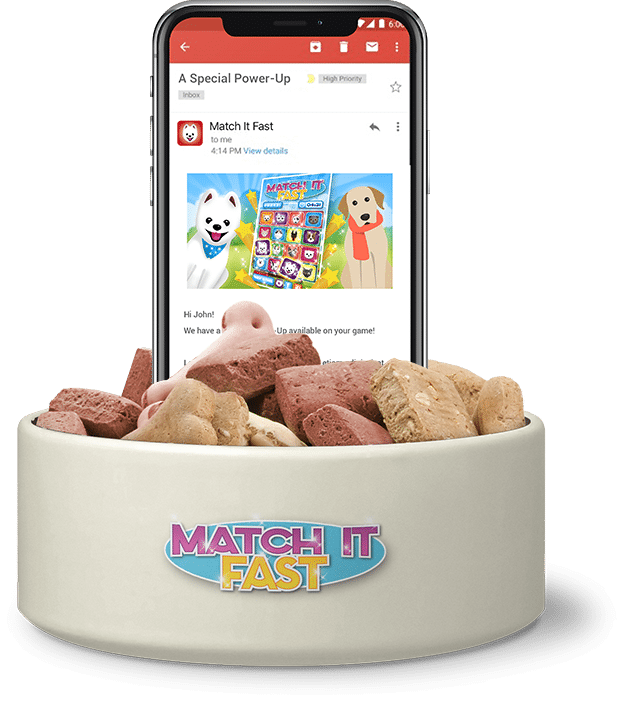 Match it fast is Pawsitively the most adorable matching game you’ll ever play! Here’s why puppy lovers everywhere are excited to play this fun fast-paced game. Tiles with cute puppy pals shuffle into place on the game screen. Pair the matching pups before the time runs out or the tiles get reshuffled. Earn 100 treats for each puppy pair matched. Tap the “Paws” pause button and the puppies will sit and stay. Every advancing level keeps the game fresh and more challenging as you progress. The puppies are ready to play! Are you? I love this game! It’s easy to figure out and fun to play. This game is an excellent choice it is addictively awesome and would highly recommend it to anyone !!!!! Can’t get enough of this game. I play it during my lunch and break all the time! This is by far the best mobile match game on mobile play. The game is simple to play and very colorful. Once I started playing “Match It Fast” I was super addicted to it! It’s challenging and fun for everyone! This app is very exciting and fast paced! All my friends and family are competing with each other to see who could get to the highest level first. It’s really fun! This is an awesome and ingenious way to entertain all ages. Very addicting and can only be appreciated when played. You will be challenged level after level. This is a must for all dog lovers. Wow what a game! I’ve played for hours and didn’t get bored. Cool graphics, sound effects and of course the game play is intense. This game definitely keeps me on my toes! And the dog characters are super cute! Match it fast is a fun and challenging game especially as you move up in levels. Great game for all ages! Safe and simple, love a good and safe game for my daughter to play. Very addicting and challenging even for the adults. Downloaded this game after seeing an ad for it and I can’t stop playing! I am a major dog lover and this game is really attractive to the eyes, great choice on graphics and definitely gets challenging! Can’t wait to share it with friends! This game has a simple idea and is fun for both me and my kids. Challenging as you get higher in levels and not a lot of bells and whistles to overwhelm you. I like it! This is seriously the perfect game for standing in line. I saw an ad for it at the DMV and played it for 45 minutes. Haha! My daughters both love this game! Definitely entertaining!!!! …To powerups and promos, straight to your inbox. Add More Pawsitivity To Your Day!